Did your people come to Canada with my people? The Waldensian was 1407 tons. 7250 ft. It had several compartments set apart for passengers other than cabin passengers. 40. Helga Thuridur Johannsdottir, wife, 22 but ?sngle? Jon Jonsson, farmer, married, 36? Kristin or Katrin Bjornsdottir, his wife, 47? Thorunn Jonsdottir, his wife, 54? E. Sigurdsson, farmer, married, 30? Katrin Magnusdottir, his wife, 40? Kristjan Jonasson? Jonsson, married, 19? I haven’t type all the names. There are according to this passenger list, 409 people from Iceland. No. 74 is Valgardur, labourer, married, his wife, Kristin, and Ketill, their son. These are my great great grandparents and Ketill, my great grandfather, whom I remember because when I visited him in his home on 4th ave. in Gimli, he used to give me a peppermint. Also, he had his coffin on two trestles in his basement. The destinations for the Icelanders were 132 for Fort Garry via Collingwood and 50 via Sarnia, Ont. 105 were destined for Toronto and 9 for Halifax. 122 were destined for the Western States. During the trip there was one child born and four people died. 2 children died during the voyage and were buried at sea. I child died in the shed. One old man on board died at the wharf. This was Jon Arnason, a labourer, married, but no wife listed, his age is uncertain but believed to be 74. 43 Icelanders were between 40 and 50 years old. 22 Icelanders were 50 years or older. My thanks to Donald Gislason of Toronto for giving me this manifest many years ago when I had supper at his home. He said, “Oh, I nearly forgot. 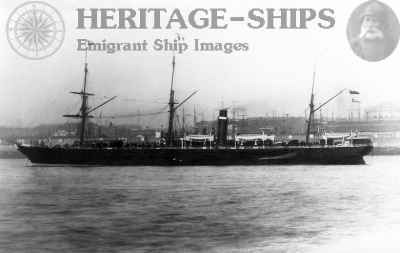 I’ve got your great grandfather in my filing cabinet”, jumped up and brought back this ship’s list of passengers. It was very kind of him, much appreciated then and still appreciated now. In 1774, Uno von Troil wrote about how Icelanders were employed. They principally fish and take care of cattle. In both summer and winter, they fish. When they return home after having cleaned their fish, they give them to their wives to dry them. During the winter, when the weather is so bad they can’t fish, they take care of their sheep and cows and spin wool. In summer, the mow the grass, dig turf, collect fuel and search for their sheep and goats that have wandered away. They also butcher their cattle. They weave wadmal that they wash in urine. Wives tan leather. A few men work with gold and silver. The women, he says prepare fish, take care of cattle, the milk and the wool, sew, spin and gather eggs and down. The amount of work farm workers have to do is set out in local bylaws. A man has to mow an area of 30 fathoms square of manured soil (as would grow on a tún) of hay. That’s a square of 180 feet. Or, if the land is not manured, then he has to scythe forty fathoms square, 240 feet to a side. If he is not scything grass but digging turf, then he has to dig 700 pieces of turf eight feet long and three feet wide in a day. If there is a snow fall and the snow piles up so it reaches the horses bellies (small Icelandic horses, remember, their bellies are close to the ground), he has to clear away snow from enough ground to feed a hundred sheep. As for women, they have to rake as much hay as three men can scythe. That’s a square 90 x 90 fathoms or 540 feet to a side. If a woman is weaving, she has to weave three yards of wadmal in a day. The wages of man are four rigs dollars and twelve yards of wadmal. A woman gets two rigs dollars and five yards of wadmal. When working men aren’t needed at the haying and are sent to the coast to fish from the 25th of September to the 14th of May, the farmer is to supply them with six pounds of butter and 18 pounds of dried fish every week. Von Troil thinks this is quite generous but then points out that when they are at the farm, they can get milk, skyr, etc. and that is not available at the fishing stations. When they are at the farm, the working men are to be fed five pounds of dried fish and three quarters of a pound of butter each week. A hundred years later when our ancestors were faced with one natural calamity after another, cold weather, volcanic eruptions, communicable diseases, and they saw that it was now possible, because of the English ships that came to buy sheep and horses, that they could leave, conditions had not changed much for the people working on the farms. Someone writing in 1872 would have said the chief occupations of the Icelanders is fishing and taking care of their cattle. There were no forests, mines, cities. Iceland was still a country of farms with the wealthy farm owners doing everything possible through politics and control of the law, to keep society the same. Why wouldn’t they? They had a supply of cheap labour. While the resources of the country were such that there was no wealthy aristocracy, descriptions of the well-to-do farmers show that they lived in comfort, that their children were educated, were given preference for positions in the civil service, the church and in business. Given the scarcity of land, the poor wages that meant it was difficult to save enough money to buy even marginal land, the rules that restricted people from fishing more lucratively, it was no wonder that stories of land and opportunity were passed from farm to farm. If a man could scythe a field 180 feet square of manured hay in a day for someone else, he could scythe it for himself. If a woman could rake a square plot of hay 540 feet to a side in a day for a farm owner, she could rake it on her own farm just as well. There was no way of creating more grazing land in Iceland. There were no opportunities for young people. Icelandic women, von Troil, says are very fertile, many have twelve or fifteen children. A farm could not be divided into twelve or fifteen plots. The eldest son might get the farm but that left a dozen brothers and sisters having to become indentured servants. This wasn’t just a problem in Iceland. The same problem, although perhaps not so severe, existed in other countries. In an agrarian society, everything depends on ownership and control of land. There is only so much of it. A hundred years would pass from the time of von Troil’s visit until the emigration to North America began but little would change except, finally, the giving up of the Danish trade monopoly, the coming of the English and Scots with silver and gold that could be used to buy passage to the New World. The availability of ships that would take people to England and Scotland and others that would take them from there to North America. And, finally, the need of both the United States and Canada for settlers, a need that meant both governments and businesses such as the railways, would encourage and assist the emigration. As a boy, I used a scythe but the most I scythed in a day was half a lot, 66 feet by 75 feet. It was hard work. To do it well, your body has to work like a machine, your arms and body swinging, not stopping until you need to take out a whetstone and sharpen the blade and that blade must be razor sharp. There is a skill to it. It demands much of your arms, your back, your legs. It is mind-numbing like any repetitious physical job. Paintings of the noble workers scything and raking hay may look romantic, nostalgic, but there is nothing romantic or nostalgic about work that turns people into machines. 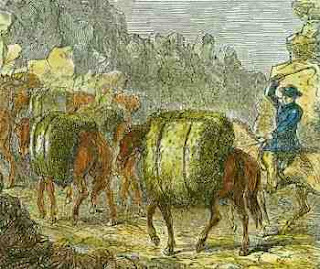 In Canada, the settlers worked on farms at harvest time to earn cash. The work was brutal but, at least, they said, there was lots of food. They were paid in cash and there was lots of food. And they were already living on their own land. Besides the calamities caused by cold summers, icebergs, unseasonal storms, von Troil say that other calamities occur that make the life of Icelanders difficult. Polar bears arrive every year and kill sheep. The Icelanders, as soon as they see a polar bear, get together and drive them away. Because they don’t have guns, they have to use spears. The government encourages the killing of the bears by offering ten dollars to anyone who kills a bear and also buys the skin of the dead bear. The bear skins can only be sold to the Danish king. Another disaster is landslides. Von Troil says that these are so large, at times, that both farm land ad houses are destroyed. He mentions that in 1554 an entire farm in Vatndal was ruined and thirteen people killed. The other disaster is created by huge snowfalls that result in avalanches. One night, in 1699, two farms were buried in an avalanche that killed all the people and animals. He says that he cannot pass over the effects of earthquakes that often happen, before a volcanic eruption. In 1755, there were fifteen violent shocks that were so strong that they destroyed farmhouses and buildings. He thinks that the “food and mode of living in Iceland do not at all contribute to the strength of the inhabitants. One seldom meets with any of t hem above fifty or sixty years of age, and the greater part are attacked in their middle age by many grievous complaints. He says that the diseases most common are scurvy, leprosy, gout and rickets. It is obvious from his descriptions that there are no real treatments or medications that would be of any use. With a very restricted diet, malnutrition, extremely hard labour, the constant damp both inside and out, the harsh weather, it is surprising that the Icelanders manage to survive as long as they do. The life von Troil describes in 1772 is brutal with few pleasures. Every day is a struggle to get enough hay, to get enough milk, to get enough fish, to survive. For a hundred years more, the Icelandic peasant had to endure this life but all things change and although those alive in 1772 wouldn’t live to see the change, their descendants would. At last, when the opportunity to emigrate to North America came, it is no wonder that the Icelanders survived the harsh conditions in New Iceland. They were used to difficult, punishing weather, used to struggling to find enough to feed themselves, used to working at hard labour. They were used to walking long distances. The men were used to rowing boats on the North Atlantic in winter. They were used to living in small, crowded spaces with only the barest amenities. The first years in New Iceland there was cold, lack of food, disease, poor living conditions but they’d seen all this before. The difference was that there was all around them the possibility of a better life. The coming year didn’t have to be like the one before. There was arable land to clear and sow, land that was theirs, the opportunity to fish for themselves with no share for the landowner/boat owner, no share for the church, no Danish stores that set both the buying and selling prices, all the wood they could possibly want for building and fuel. They still suffered from scurvy, small pox, rickets but, soon, that would be over. Soon they no longer had to live on boiled fish heads, on sheep bones softened in whey. Women working as domestics in Winnipeg no longer spent entire days hammering dried cod to eat with butter. They didn’t have to rake hay for ten hours a day or longer. The Icelandic emigrants took their lives in their hands and voted for change. 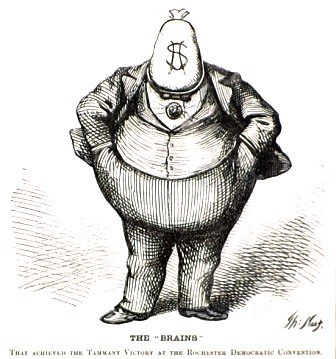 The cost was alienation, sometimes death, but they broke the cycle that had gone on for hundreds of years, gone on with so little change that von Troil’s observations were as accurate and valid in 1872 as they were in 1772. Many emigrants did not grow rich but they had a place of their own to live, food to eat, clothes to wear, they weren’t indentured servants. It was enough. Just in case anyone has thoughts about how their ancestors must not have been very good at agriculture and if they’d just worked harder, been smarter, they could have grown oranges and watermelon, or even wheat and oats, here’s an account an abridged account of agriculture in Iceland in 1772 by Uno von Troil. As may be seen in many passages of ancient Icelandic accounts, grain formerly grew in Iceland. At the current time (1772) “Governor Thordal sowed a little barley which grew very briskly but a short time before it was to be reaped, a violent storm utterly destroyed it, so that only a few grains were found. “If we consider besides these strong winds, or rather hurricanes, the frosts which frequently set in during May and June, we shall realize there are a number of difficulties that check the progress of agriculture in Iceland. If notwithstanding these obstacles, it can ever be brought to a thriving condition, it must certainly be under the present indefatigable governor, who has the welfare of the country much at heart, and, in conjunction with the government, studies every possible means to promote it. “I consider these violent winds, and the Greenland floating ice, which every year does great damage to the country, as the chief cause of the diminution of the growth of wood, as well as of the ill success in the late attempts for introducing agriculture. “The ice comes on by degrees, always with an easterly wind, and frequently in such quantities, as to fill up all the gulphs on the north-west side of the island, and even covers the sea as far as the eye can reach. It also sometimes drives to other shores. It generally comes in January, and goes away in March. Sometimes only reaches the land in April, and remaining there a long time does an incredible deal of mischief. It consists partly of mountains of ice that are sometimes sixty fathoms high above the water”. “Followed by a famine.” What do we know of famine in North America where grocery stores throw away vast amounts of food every day? Where even street people can get food from various agencies? Where schools often provide food? Where churches have programs to feed the poor? There is waste on a tremendous scale. There is unfairness built into the system. There are poor diets and hungry kids in school. But there is no famine. Famine is when there is no food. No food. Where people slowly die of hunger because there’s been cold weather, storms, no grass. There’s no food no matter where you look or how far you walk before you can’t walk anymore. An inch of ice in May. Three feet of snow in June. Farm that! There was nothing Icelandic farmers could have done against the storms. Nothing they could have done against the icebergs. Nothing they could have done with ground too cold to grow grass. Three months they had every year to harvest enough grass to feed their sheep and cows over the nine months of winter. It was like a mathematical formula. Twenty people on the farm. Twenty people times nine months of skyr, Icelandic moss, preserved meat, dried fish, rye flour, butter, seaweed. Enough grass to feed four cows, fifty sheep times nine months. The horses, although critical to travel and trade, were on their own. Grass from the home field was too valuable to be wasted on horses. The sheep came first because they provided milk and milk meant staying alive and if you didn’t stay alive, you didn’t need a horse. Dead men don’t ride horses. 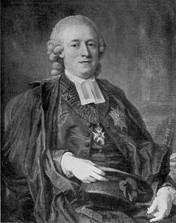 In 1772, Uno Von Troil, joined Joseph Banks in a journey to Iceland. Afterwards, he wrote a series of letters about the expedition. The language is now archaic and, for many people, difficult to read. Therefore, I have “translated” as best I can, some of his writing into modern day English. There will, of course, be errors, for I am no scholar, but hopefully they will be minor and will neither mislead the reader, nor interfere with the pleasure of reading about Iceland a hundred years before our ancestors began to leave for North America. Because I must change the archaic spelling so much, I’ll use quotation marks only to indicate that the material is taken from von Troil. “The Icelanders are of a good honest disposition, but they are, at the same time, so serious that I hardly remember to have seen any one of them laugh; they are by no means so strong as might be supposed, and much less handsome. Their chief amusement, in their leisure hours, is to recount to one another the history of former times; so that to this day you do not meet with an Icelander who is not well acquainted with the history of his own country; they also play at cards. “Their houses are thatched with turf and so small that you can hardly find room to turn in. They have no floors; and their windows, instead of glass, are composed of thin membranes of certain animals. They make no use of chimneys, as they never light a fire, except to dress their victuals, when they only lay the turf on the ground. You will not think it strange, when I inform you, that we saw no inns, except shops and warehouses; and on our journey to Hecla we were obliged to take up our lodgings in the churches. “Their food principally consists of dried fish, sour butter, which they consider as a great dainty, milk mixed with water and whey, and a little meat. They receive so little bread from the Danish company, that there is scarcely any peasant who eats it above three or four months in the year. They likewise boil groats, of a kind of moss (Lichen Islandicus) which has an agreeable taste. The principal occupation of the men is fishing, which they follow both winter and summer. The women take care of the cattle, knit stockings, etc. They likewise gut and dry the fishes brought home by the men, and otherwise assist in the preparing this stable commodity of the country. The startling thing about von Troil’s letters is that they differ very little from Mackenzie’s account of Iceland in 1810, 38 years later, or even from Kneeland’s description in 1874, just over a hundred years later. 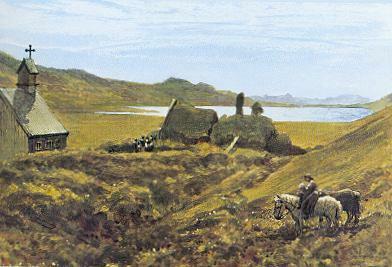 It is accounts like these that make clear how trapped the people were by the small amount of useable land (one cannot say it was arable for it was only used as pasture except for the home fields and those were not cultivated, only fertilized), by the weather that would not allow grain to ripen, and by a Danish monopoly that sold commercial rights to a group of traders whose sole purpose was to extract as much wealth from the country as possible.However, something that is occasionally mentioned is that the lack of progress was also the result of a land rental system (share cropping) that penalized any land renter who improved his land. If he leveled the frost mounds in his home field, for example, the land owner would raise the rent.Any benefit from making improvements would not go to the renter but to the large land owner. As much as the Hanseatic League traders exploited Icelanders, the turning over of trade to a commercial monopoly was not unique. Numerous governments sold the rights of trade to companies, including the English government when it gave the Hudson Bay Company the right to vast amounts of Canada. There was no kinship between the kings and queens and the natives in North America, South America, Australia, the Dutch Indies, India. The people there were there to be exploited so that wealth could be accumulated in the “mother” country. The surprising, even shocking element in Iceland’s story, is that there was, in fact, kinship between the Icelanders and the Norwegian and Danish crowns yet they were exploited as if there were no kinship. The Icelanders were not savages in a distant land. They were the descendants of Norwegians, Irish, Scottish, some Danish, settlers. They were Lutheran. They spoke a Scandinavian language. The farming landowners often sent their children to Denmark for their education. It made no difference. For whatever reason, the Icelanders were “other”. When the Danish king came in 1874 to give Iceland a constitution, he said he was sorry that he could not speak or understand Icelandic but that his son was learning it. Iceland had been a vassal state of Denmark’s for hundreds of years but was so unimportant to the Danish crown that Icelandic was not learned by members of the royal family. The language, except for the romantic aura of the sagas, was relegated to all those other colonial languages that weren’t worth learning. When Sir George Mackenzie travels around Iceland, he is accompanied by letters of introduction. He is no young man without means but a powerful, titled, well-to-do Scotsman, highly educated and recognized. He was the youngest person, age 18, to ever be inducted into the Scottish Royal Society. His recognition was for proving that diamonds are made of pure carbon. He comes to Iceland because of his interest in the geology. However, since, there are no commercial inns or way stations in Iceland, he and his friends must stay in churches, farmhouses or tents. They must find grass for their horses. Although they have with them some food and are able to shoot birds and catch fish, they are in need of the milk, cream, skyr, rye bread and fish that can be provided by the local farms. Because of his connections, Mackenzie is able to stay at the homes of the wealthiest farm owners, the best-off priests. He does not have to stay in the Icelandic farm homes that he describes as wretched, filthy, ill-smelling and crowded. 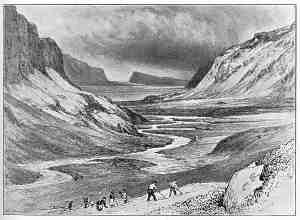 Yet, his book, Travels in the Island of Iceland During the Summer of the year MDCCCX (1810), is highly valuable because of his observations of life in Iceland. His attention to culture can best be seen during his visit to Indreholm, the home of Chief Justice Stephenson. It is here, during a supper unimaginable to the ordinary Icelander who lived on coarse rye bread, skyr, milk, butter, dried fish and, perhaps once or twice a year, meat. There is boiled salmon, baked mutton, potatoes imported from England, sago and cram, London Porter (imported), and port wine (imported). It is while dining on this banquet that Mackenzie’s group hears music coming from another room. They were delighted. They’d never heard anything like it before and thought it might come from a piano-forte. To their amazement, the music was from an Icelandic instrument called a Lang-spiel. The musicians were Mr. Stephenson’s son and daughter. The Lang-spiel (as he spells it) was brought to the guests so they could see it. Mackenzie, in his thorough manner, describes it. 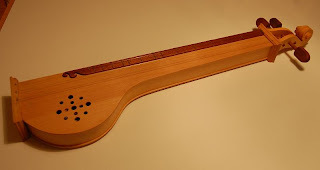 It “consists of a narrow wooden box, about three feet long, bulging at one end, where there is a sound-hole, and terminating at the other like a violin. It has three brass wires stretched along it, two of which are tuned to the same note, and one an octave lower. One of the two passes over little projections, with bits of wire on the upper part. These are so placed, that when the wire above them is pressed down by the thumb-nail, the different notes are produced on drawing a bow across; and the other wires perform the same office as the drones of a bagpipe. In short, it is simply a monochord, with two additional strings, to form a sort of bass. What Mackenzie was listening to was a traditional Icelandic drone zither. It can be played by plucking the strings by hand or with a bow or by hammering on the strings. In Iceland, because wood was not available from locally growing trees, the Langspil was made from a variety of driftwoods. In 1855, 45 years after Mackenzie’s musical evening, a book was published explaining how to make Langspils and how to play them. However, the Langspil nearly disappeared by the mid 1900s. There has been a concerted effort to resurrect it and various bands include it among the instruments on which they perform. When reading, Travels in the Island of Iceland by Sir George S. Mackenzie, it is hard to believe that it was published over two hundred years ago. It reads well, is crammed with the details of daily life in the Iceland of the time, and the people he describes, and he describes many, come to life. Mackenzie’s book was published in 1811. Could it really have been that long ago that he describes his visit to Indreholm? 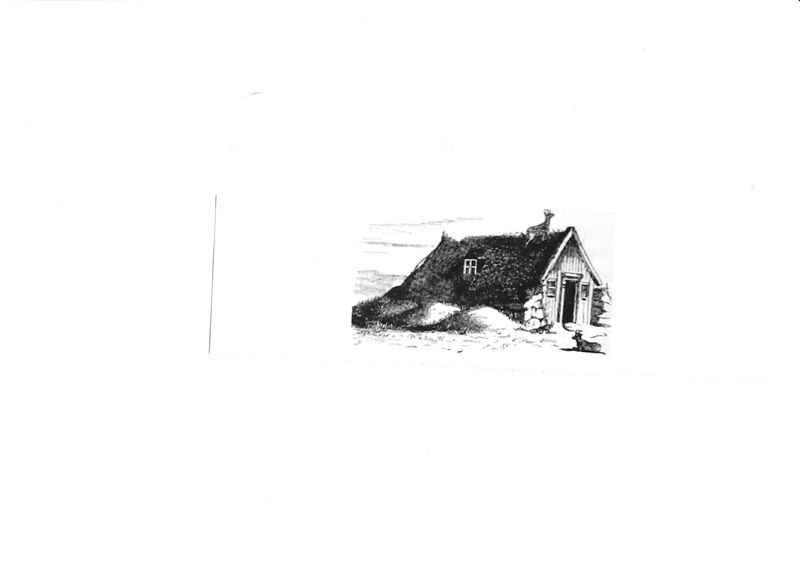 “This is the house of the Chief Justice Stephenson, from whom we had received an invitation when first we met him at Reikiavik…. It is situated in a large extant of flat, boggy ground. We arrived at the house about five o’clock…. It is rather a groupe of buildings than a single habitation; and, together, with the outhouses and the church, it looks like a little village. The house is quite large. It needs to be, besides Mr. Stephenson there is his wife, daughter, two sons, a young lady under his guardianship; his father-in-law and two nephews. There is no mention of where all the servants required to run this establishment live. At a short distance from the house is a water mill. The dairy and the other outbuildings are detached from the house. There is a smithy and when Mackenzie visits, the servants are busy sharpening scythes and he notes that they are using charcoal that is locally made from birch wood. While they are eating, they hear music and immediately stop eating because they have only once before heard music in Iceland and that was at a ball in Reykjavik which Mackenzie describes as the miserable scraping of a fiddle. Mackenzie is impressed by Stephenson. Why wouldn’t he be? 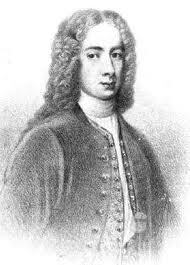 Mackenzie, himself, is a baronet, a member of the Royal Society of Edinburgh. Mr. Stephenson is “the head of the Icelandic courts of justice, and a privy counsellor of Denmark, with the title of Etatsraad and…has been very assiduous in his endeavours to distinguish himself in the walks of literature….has himself written various works on politics, history, and morals. All these amount to about twenty different books. He is the owner of a very good library of seven or eight hundred volumes, among which are a number of English works, history, novels, and poetry; and a valuable collection of Icelandic books and manuscripts. Mackenzie says that the pastures around the house are very good. “Adjoining the house are two small gardens, well inclosed with walls of turf, in which cabbages and turnips, and sometimes potatoes, are cultivated with success, for the use of the family.” There is also a small island nearby that produces forty pounds of Eider down for export. “Connected with his property at Indreholm, there is a large fishing establishment, comprehending about twenty boats of different sizes, the use of which is given to the people coming from the interior of the country. The opulence of Mr. Stephenson’s life is provided by the hardships of the ordinary Icelander. Every year men walk or ride to the coast to risk their lives at the fishing. When fish are caught, “they are divided into two shares more than the number of men employed. These two shares belong to the owner of the boat, who provides lines and hooks. When he furnishes nets, which are generally used during the early part of the season, he receives one half of the fish caught. All the people engaged for one boat generally live together in the same hut. The previous arrangements being made, a long period of hardship and privation begins. In darkness, and subjected to intense cold, these poor people seek from the ocean the means for subsisting their families the following winter….They generally remain at sea for eight to twelve hours” at a time. They take nothing to sea to eat, only some whey to drink. There may not have been royalty in Iceland, no Lords and Ladies, no aristocracy but Mackenzie’s journal makes clear how great was the difference between the wealthy, well connected farm owner and the ordinary person. The Empty Saddle by S. E. Waller. A friend brings a horse back from battle. The owner is dead. The new widow stands on the balcony. 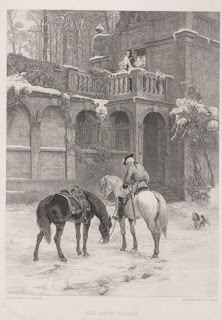 Six Weeks In The Saddle, by Samuel Edmund Waller, was published in 1874. He traveled to Iceland in the summer of 1872 and spent six weeks with three horses and his local guide, Bjarni. He should have had six horses but the demand for Icelandic horses was so great that the price had doubled before he got to Reykjavik. He didn’t have a lot of money. He’d been making a living by illustrating books. The astounding thing is that he was born in 1850 and, in 1872, was only 22 years old. He made the trip on a small Danish ship. He arrived by himself in Reykjavik, bought three horses, hired his guide, packed his belongings onto one of the horses, and went off on a six week adventure filled with danger and hardship. He went to Iceland because he’d read Njal’s Saga and had fallen in love with it. As an artist, he wanted to sketch the landscapes of the saga, plus he wanted to experience as much of Icelandic life as possible. No wonder he was made so welcome in Icelandic homes. In 1872, there were still no roads. Farms were very isolated. Foreign visitors to any individual farm were rare and, in many cases, the foreigners stuck to themselves bringing tents and food and, except for the guides, being self-sufficient. The big draw were the geysers. They were one of the wonders of the world. Others land in Reykjavik, rent horses, hire guides and drovers, make the trip to the geysers, return to Reykjavik, then they go home. Waller wanted none of that. He had little money. However, even if he’d had the price of three more horses, he’d have wanted to spend time with Icelanders because he was in love with the sagas and the landscape. No wonder he was so welcome everywhere he stopped. No wonder the young women played games with him, sang with him, played music for him. While they were exotic to him, he must have been every bit as exotic to them. A young man from England, appearing suddenly, congenial, talented, educated. No wonder beautiful young women kissed him on the cheek. These are people who want to know all sorts of things, who know that knowledge is out there in the wider world, they want to know everything, everything. One of the last places he visits is Thingvalla. He describes it in detail and tells a bit about its history. “It is impossible to give any idea of the feelings of deep interest with which I regarded every inch of this romantic spot, and tried to imagine what an appearance it must have presented 900 years ago. I wondered where Hallgerda’s booth was. I know that it was just down by the water that Gunnar first saw her sitting in the doorway. Njal‘s booth too, was some two or three hundred yards down the river on the other side. It was here that the desperate battle took place between Njal´s assassins and his avengers, and it was between the water and the lava that so many of t hem were killed.“ How many of us know Njal‘s Saga that well? Waller’s father was an architect and Waller spent a short time as an apprentice to him; however, he never practiced architecture but, instead, pursued his dream of being an artist. He went to art school. He worked for a brief time on a farm and learned to love animals. He was passionate about horses and they figure largely in his paintings. His paintings received acclaim and he had numerous exhibitions at the Royal Academy from 1871 to 1902. He died in 1903 at the age of 53. If you put his name into Google, you will see a large number of his paintings. They are romantic, sentimental, dramatic, nostalgic, and command high prices. Copies of them are widely available. I, for one, am glad he made his trip to Iceland and wrote Six Weeks In The Saddle. I’m pleased that I discovered it for it gives a very different view of Iceland and Icelanders than the accounts of many of the explorers and scientists or professional travelers. Waller arrives at Sorg. He sends his guide, Bjarni, off to Reykjavik on errand. Waller enjoys sports fishing and he asks the local farmer to take him to fish. When they arrive at the river bank, the farmer says, “It’s cloudy. That’s good. The flies won’t bother us. The farmer tells Waller some stories about how dreadful the flies are and Waller dismisses it all as exaggeration. He has a wonderful day fishing. Every time he casts his rod, he catches a fish. Suddenly, Waller begins to feel hundreds of sharp little stings. A wind comes up, chases the flies away, then the sun goes behind a cloud and all seems well. Waller begins to fish. Iceland may have not fierce tigers or lions, no venomous snakes, no rampaging elephants, but it has its hoards of midges and just after Waller has hooked his first fish, the sun comes out again and, in a moment, “ ‘the devil was unchained’ “…from the earth, the grass, the rocks, in fact, from everywhere rose a living fog of countless myriads of long winged flies. “Sting, sting, sting, on they came. It was useless to attempt to beat them off. We had our handkerchiefs out in a moment, and tied them round our heads, leaving a small slit for one eye….We pulled our socks up over our trousers, put the wading boots over the socks, tied string round our sleeves, and attempted to get away. When they get back to the farm, Waller discovers that his face, neck, and wrists were swollen dreadfully, and covered with bites, and his right arm was covered in a rash from the shoulder downwards. No crazed berserker could have been more formidable than the tiny Icelandic flies for what they lacked in size, they made up in numbers. Myvatn, midge lake, takes its name from them, midge water, but the name seems harmless enough. Even in Canada, Mosquito Lake doesn’t conjure up a desperate fight for survival against a tiny enemy. Although, when I taught at Snow Lake, Manitoba, I went fishing in a creek when the black flies were out and my daughter’s sweat shirt came loose at the back without our noticing it for a few minutes. By the time we did notice, it looked like she had a cluster of grapes on both sides of her spine. The farmer, on the first fishing expedition, had said to Waller, that two horses had died from fly bites and Waller had thought it a gross exaggeration. By the time the second fishing trip is over and he and Bjarni are back at the farm, he knows it was no tall tale. The next time you visit Iceland and go to Mývatn, think of Waller and his desperately running for a mile before he escapes from the midges.